Most of the liberals and other normal people in this country are probably really angry at Senate Majority Leader Harry Reid (D-NV) for passing up an opportunity to reform the filibuster rules that have turned the U.S. Senate into a tar pit where democracy goes to die. 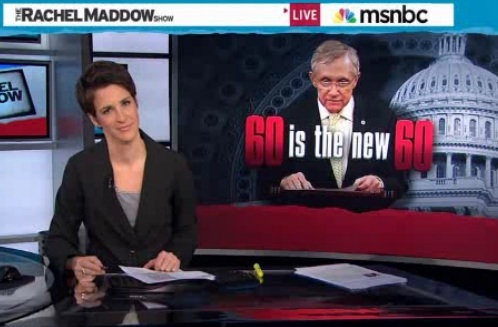 On Thursday night’s The Rachel Maddow Show, host Rachel Maddow exhaustively detailed all of the times Sen. Reid promised to end the so-called silent filibuster, and to do so with a simple 51-49 majority if necessary. This afternoon, Sen. Reid chickened out, but he had a good reason to. That reason, though, isn’t good enough. It’s hard to tell, but Rachel was pissed about this. I bet she even thought up real curse-words in her head, because “bull-puckey” doesn’t cut it at a time like this. So, why did Reid cave? A second explanation for Reid’s early enthusiasm for reform might be that Reid needed to convince McConnell to strike a deal and that the only way to do that was to scare him a bit. “Whenever you change the rules here,” Reid said, “you have to show the other side you can change them with 51 votes.” It’s the fear of the partisan reforms, in other words, that leads to bipartisan reforms. Reid understands that his threat cuts both ways. See, the problem isn’t with changing the filibuster rules, it’s with changing the rules at all with a 51-vote majority, because even if Democrats make a perfectly reasonable rule change using the new Congress loophole, there’s nothing to stop Republicans from going nuts when they retake the majority, and giving themselves the right of primae noctis, or making a rule that all Democrats have to resign. That’s why Harry Reid is not such an idiot for backing away from this threat. Here’s why Harry Reid is kind of an idiot for backing down: there’s still nothing to stop Republicans from going nuts when they retake the majority, and they will. When Republicans retake the majority, if Harry Reid is still in the Senate, we will see him at a microphone in a Republican-mandated propeller-beanie and “I’m With Stupid” t-shirt with the finger pointed up at his face ensemble, complaining about how his learned colleagues have broken with all precedent, and he will not stand for it next time he’s in the majority. The election of President Obama set off a chain reaction of broken norms by Republicans, which began the night he was inaugurated, and culminated in his reelection by a country that won’t ever go back to being the Republicans’ natural friends. They are desperate, and like cornered rats, they will lash out with frothy fang, and filthy claw.